Every day, sports fans congregate at their nearest big-league stadium to bask in each other’s cheers, body paint, and beer, relishing their shared enthusiasm for the teams they love. But then the game ends. Everyone is forced to head back to their normal lives to trudge through their day jobs once more, at least til the next home game comes round. Social media can offer them some comfort, giving them a chance to take the community home with them. Unfortunately, many professional sports teams are still failing to tap into this effectively. FanChatter, a Y Combinator funded company that’s launching today, is a startup that’s looking to help fix this problem. The company is focused on helping major sports teams increase engagement both during and after games using user-submitted content, Twitter, and other social services. And while the company is still quite new, it’s already got some major customers, including the Minnesota Twins, the Minnesota Timberwolves, and the University of Oaklahoma. 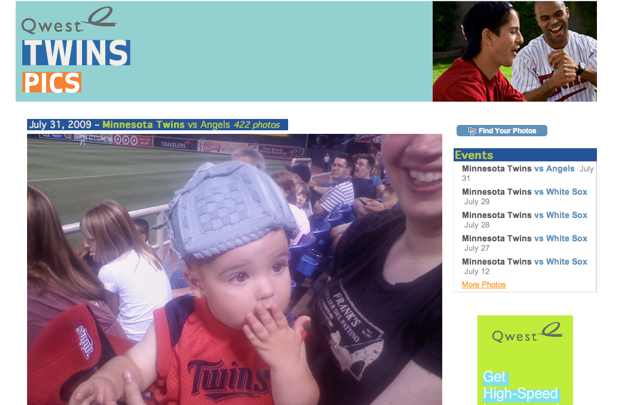 One of the site’s core features is its photo gallery. During games, fans are encouraged to Email photos taken from their cell phones to a designated Email address, for the chance to have their photos appear on the stadium’s Jumbotron. Teams receive the photos in real-time and build photo galleries from them, which they can then use in place of the candid video shots we’ve all seen so many times between innings or during a time-out. Obviously teams aren’t able to display every photo submitted, but FanChatter also takes these photos and builds a shared photo album — one for each game — which can then be accessed by fans from the team’s home page. You can see what these albums look like by checking out the Twins’ page here. Fans will also soon be able to share their videos taken at the game, though these likely won’t be appearing on the Jumbotron as they take too long to filter through. 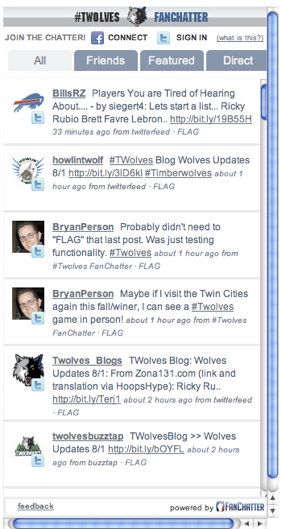 Another of the company’s features is the ChatterBox, a widget that can display a stream of tweets relevant to a particular hashtag or topic (the Timberwolves have one that shows tweets with the tag #twolves). Fans can use this to communicate during the game, and to follow the latest news from home. The widget is similar to one that’s offered by Tinker, which launched earlier this year. FanChatter licenses its technology with fees set on a case-by-case basis, and has plans to extend its technology beyond sports to include other major events, like concerts. It also has plans to roll out iPhone applications, which would give fans a better way to interact with each other while they’re still at the game.